Seven West Media’s Pacific Magazines has launched a 16 page TV Extra as part of New Idea magazine. However, there’s no mention of a full TV guide. New Idea today also becomes ‘official magazine partner’ for MKR. 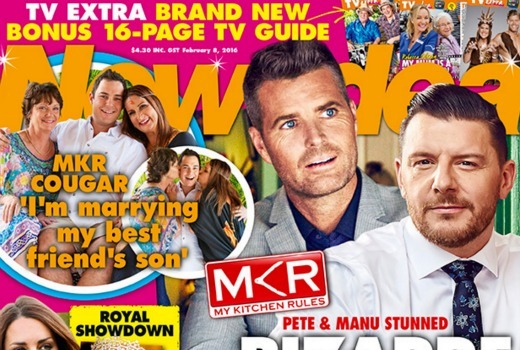 Fiona Legdin, Group Publisher, Weeklies, comments: “New Idea’s partnership with MKR brings together two of the country’s favourite brands, and coupled with the launch of TV Extra, it’s an incredibly exciting time for the New Idea brand. “With an audience footprint of more than 4.4 million, the brand’s continued reach and relevance is impressive, and we‟re continuing to invest in this audience into the future,” Legdin added. Last year Bauer Media axed its stand-alone Soap Extra and Top Gear Australia magazines while SBS folded Feast. I was hoping the TV Extra ‘magazine’ was a pull out supplement, instead I had to flick through ‘trashy’ articles. The quality of the Molly Meldrum and Sam Johnson pictures was quite poor, gee Molly looks terrible, doesn’t age well. That also goes for Farmer Lance. I was surprised Neighbours got a mention – all 7 lines about the return of Lyn Scully. $4.30 per week, that’s $224 yearly, I can do without. I’ll just flick through like so many others do, treating the supermarket and newsagent like their personal library. That’s because it would be inaccurate before the magazine had finished printing. As others have said, this looks like it will really be Seven Extra. More like Seven TV Extra. So the price of the magazine will go up for 16 extra new pages I guess. All-new ‘TV highlights’ – as long as they’re on 7! I don’t think they’ll present much competition for you, David. Though I’m sure you’d love those audience numbers if you could. Ha! This is like when you read The West Australian its full of channel 7 shows. Bella: Your right only seven shows. Nothing about Nine. Buy the Tv Week has every channel covered. ” I’m marrying my best friends son”…It’s hard to believe 4.4 million people read this tripe.